This post continues the personal anecdote series on the site. The series includes pieces both by people who are active supporters of open borders and by people who aren’t directly involved but have formed opinions on the issue informed by their personal experience. This blog post is of the latter kind. The author is a middle-aged female who has lived all her life in India, and the post is being published anonymously at her request. It took a trip to Punjab with my parents to get me thinking about what borders mean. I was in my teens and visiting Amritsar with my parents when my father suggested going to Wagah (on the border with Pakistan) because he had some work there. This was just a few years after the 1971 Indo-Pak war and I asked my father whether it would be safe. He laughed. My mental image of what a border should be like was vague and uninformed—something impenetrable, something clearly separating two countries that had fought wars. The border I saw the next day was so commonplace that I can’t remember any details. What remains in my memory is my utter disbelief that the land on the other side of the gate, so nearby and similar, was Pakistan. Men from the two sides were exchanging mail bags in a normal, everyday manner. I felt downright foolish. What difference had I expected to manifest itself suddenly across a border? But surely a border should be more secure. I asked her why we didn’t have tall walls with barbed wire and broken glass and with the army guarding the entire length of the border. She asked me if I had thought about how very long the border was and whether that would be practical (It’s 2900 km, according to Wikipedia). On the way back, and for the weeks that followed, my mind kept slipping back to that glimpse of the Wagah border. All our relatives and friends were from North India and had been affected, in small or big ways, by the 1947 Partition of India but they rarely talked about their tragedies and losses except in hushed tones when they thought the children were not listening. My mother, for example, had spent part of her childhood in a city now in Pakistan. I knew many families that had hurriedly migrated to India during the Partition. I tried imagining a village getting split into two because a border now ran through it, families either divided across countries, or forced to leave their homes, abandoning most of their belongings and objects gathered over generations. The tragedies depicted in fiction based on the Partition moved out of the pages of story books and into my heart. Back then, in the 1970s, we had no Google search or Wikipedia pages to satisfy our fleeting curiosity. We had to scout around for relevant books and articles, or pester elders, and our curiosity had to cross a threshold to make such perseverance worthwhile. Yet, even though I moved on to other areas of interest, there was a shift in how I thought, not just about Pakistan, but about countries, borders, immigration, and patriotism in general. I began realizing that nations may be created overnight based on emphasizing some aspects of identity (such as language spoken, religion, borders of older kingdoms, geographical features like mountains, rivers, and seas) through hastily re-arranged populations and enforced borders but the emotions of people are not so easy to change and that a lot of the silence or rhetoric around that division is based on frustration, bewilderment, pain, and loss. Citizenship began seeming more like chance, a combination of history and time and space, rather than a person’s intrinsic characteristic, and while I appreciated that countries needed borders and laws around them, I started thinking of the rigidity and emotional fervor around the sanctity, shape and impenetrability of borders as excessive. I had changed in small ways. For example, while watching a match of cricket, a sport passionately followed both in India and Pakistan, I cheered more often based on the quality of the game rather than the country playing. India’s performance in a match did not seem tied to my core identity. I no longer felt either “proud” or “ashamed” of being an Indian. My being Indian was just a fact of my life. There seemed no logical reason to believe that my country was better than others merely because I was born here. Paradoxically, I was more open-hearted in my appreciation of significant Indian milestones because that was based on genuine evaluation rather than pre-scripted loyalty. Many of my peers had started going abroad for higher education and jobs driven by practical factors like available opportunities and quality of life. They were opting for resident status outside India, things like green cards or citizenship. I wondered how they felt while taking the oath of citizenship of another country and how they emotionally reconciled it with a childhood spent singing the Indian national anthem, and expressing pride in India’s culture and heritage. 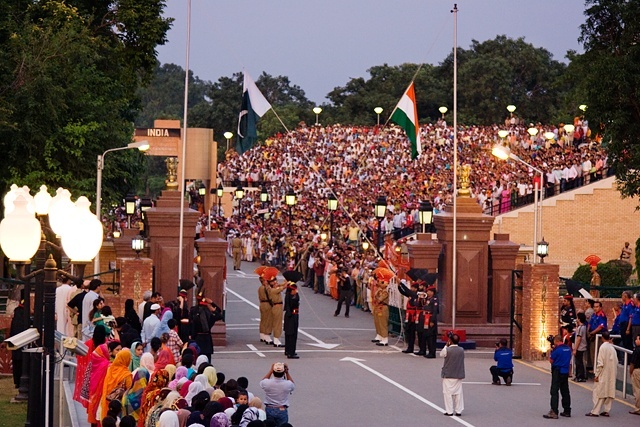 Much has changed in the four decades since I saw the Wagah border. Information is more easily available. Borders seem superfluous when surfing the Internet, except when countries ban certain sites, a rude reminder of reality. We know far more about life in other countries than we did a few decades ago, and many prominent products and brands are available in all countries. International travel is easier and more common, and many families are scattered across the globe. When my peers express fears that their children may not return to India, I tell them that our children’s generation does not view moving between countries and settling in one country as against another as a major emotional decision. They choose their location based on multiple factors that include quality of life, type of jobs, convenience, and so on. That they were born or brought up in a country is just one of the several criteria. The hitches in mobility across borders jar more in this interconnected world. Time and again I hear of persons working outside India being tense because their stay abroad depends on that country’s rules and quotas rather than on their productivity and contribution to its society. That seems a suboptimal way for the world to run, maybe suboptimal even for the country enforcing the rules. To me, borders seem somewhat arbitrary, whether of countries or smaller geographic units. Once, on a visit to a small and beautiful hill station (in North India) I saw large notices declaring that “outsiders” could not buy land and build in that town because that would involve chopping trees and clearing land, thus spoiling the natural beauty. Interestingly, the officials in the town’s governing body had moved to that town just a few decades ago, and had bought and cleared land there to build their elaborate houses. It seems self-serving when current residents of a place label future migrants as outsiders, although they, too, are migrants. Borders don’t just demarcate and divide and keep people out, they are the cause of simmering or outright conflict. Reminders of their existence pop up at unexpected times, even for persons like me who rarely cross borders. Recently, when preparing a presentation for an international conference, I was looking for a map to illustrate country-wise data. I had often read of some issues of international magazines getting banned in India because they depicted the Indian map wrongly. On surfing the Internet I realized that this (‘wrong’) depiction was the one used all over the world. If I selected a map consistent with what my fellow-countrymen expected, the map would not match what persons from other countries expected, especially those from neighboring countries. And if I used the one that the international audience was familiar with, the Indians would be uncomfortable. On a somewhat philosophical note, it puzzles me that people assume that borders are a given, that they must exist, and that the only debate is on who can cross them and when and how. My attempts to discuss issues around borders with peers have resulted in my being stared at as though I were weird, maybe even (gulp) unpatriotic and thus a bad person. Many countries, especially democracies, have legislations prohibiting discrimination based on race, age, religion, and gender. Discussions on topics like gender-discrimination, racism, ageism, and communalism can be openly found–some emotional and even confrontational, and others well-reasoned and insightful. But discrimination based on place of birth and citizenship is accepted as reasonable, moral, and good. Each country wants to guard its resources and therefore promotes patriotism and pride in one’s country through the education system, laws, and other mechanisms. Society promotes this. As a result, we consider the welfare of our country more important than that of the world as a whole. I am now in my fifties and I have not been outside India except for a few, very short trips. My current day-to-day life is not particularly affected by the existence of borders or the rules around them. I do not know enough about “open borders” to take a position on their desirability or wisdom. This is not one of the causes that I am active in. But I consider this area important enough for serious discussions, and not just confined to activists or people directly affected by immigration. Such discussions could be part of developing systems that work for what is better for the world as a whole. See more posts in our personal anecdote series. Imaginary lines: the borders of Southeast Asia and the Nusantara by John Lee, April 3, 2013. Skirting Around the Restrictions: Will Technology Make Borders Obsolete? by Chris Hendrix, May 15, 2013. The Future of Immigration Economics by Eli Dourado, December 29, 2012. A Somali-Swede’s reflections on open borders by Ladan Weheliye, September 20, 2013. Open Borders Allow People, Not Their Place of Birth, To Control Their Lives by Joel Newman, March 31, 2014. Bangladesh and India: move towards open borders by Vipul Naik, January 15, 2015. Nepal and India: an open borders case study by Vipul Naik, March 21, 2014. We use the term citizenism (coined by immigration critic Steve Sailer) to describe the idea that government policy, particularly immigration policy, should favor the interests of current citizens. For more on how the Indo-Pak border was actually drawn, check out Wikipedia’s page on the Radcliffe Line. Note: The author has requested that the article not be republished without consent, and be published under standard copyright rather than using a Creative Commons license. Due to technical limitations of our software, the piece may show up as marked with a CC-by-NC-ND license. How my day in Wagah led me to rethink borders is licensed by Anonymous Blogger under a Attribution-NonCommercial-NoDerivs 3.0 United States.